USIU-Africa and Audencia Business School have signed a Memorandum of Understanding that will see the two academic giants conduct joint organization of scientific, educational, and cultural seminars, conferences, symposia, and workshops. 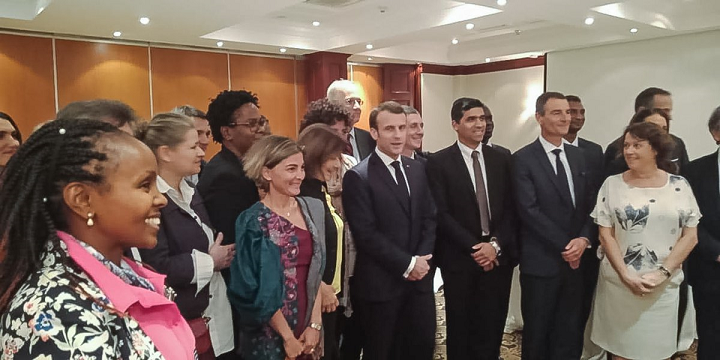 Vice Chancellor Prof. Paul Zeleza signed the agreement together with the Dean, Audencia Business School Christophe Germain on March 14 at the Ministry of Education headquarters during French President Emmanuel Macron’s visit to Kenya, in the presence of French Minister of Higher Education, Research and Innovation Frédérique VIDAL. The agreement, which also provides for the coordination of joint research projects, development of joint programs or double degrees, and special short-term academic programs, is expected to lead to visits and exchanges of faculty, students at the graduate level, administrative personnel, and other appropriate personnel. Speaking during the signing ceremony, the Dean Christophe Germain concurred saying, “Audencia Business School cannot be more honored to be entering into a comprehensive partnership with USIU–Africa.” He further added that Kenya is considered as the educational and economic powerhouse of East Africa, and as such it was of strategic importance for Audencia Business School to establish a comprehensive partnership with a leading private university in the region. He termed this partnership as mutually benefitting both parties, given that USIU-Africa is aligned with their values of innovation, cooperation and responsibility. Prior to the signing ceremony, Prof Amos Njuguna, Dean, School of Graduate Studies, Research and Extension visited Audencia’s campus from February 26 to March 2, to find areas of collegiate collaboration between the two institutions. At the end of the visit, the Collaborative Institute for Global Agribusiness (CIGA) - which brings together academic, corporate and scientific partners to provide multidimensional education, consulting and research for stakeholders across the global agricultural economy – was proposed as a partner to USIU-Africa’s Global Agribusiness, Management and Entrepreneurship (GAME) Center. The collaboration envisages a multidimensional approach to explore, analyze, advice and train stakeholders within the agriculture sector and agri-food businesses, geared towards developing skills, imparting knowledge and developing programs for young farmers in the region.